My favorite part of the creative process for Green Gables Knits was making arrangements for the photography. On and off over the course of two years I scouted locations, props, clothing, shoes, jewelry... I love how the photos turned out, and that the book has a distinct "period" feeling to it, and that the patterns have that "classic" storybook look to them. At the same time, I was hoping that the patterns would be versatile enough to work in a wide variety of yarns by fiber, style, and color. Here you see Diana's Hat as published in the book. I just love this photo of Diana, waiting to walk to school with Anne! Here is an example of Diana's Hat done up in a really different color style. 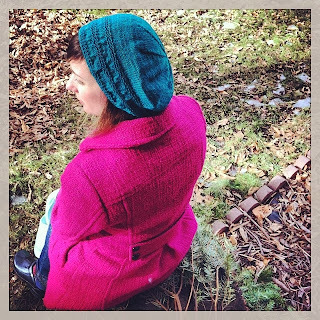 It is actually the exact same yarn called for in the pattern, Brown Sheep Company Lamb's Pride Superwash Sport, but in a bright turquoise color. With my hot pink coat, it really is a different look, isn't it? But I think it works, and confess that I like me "new favorite hat" so much that I have taken to wearing it around the house. 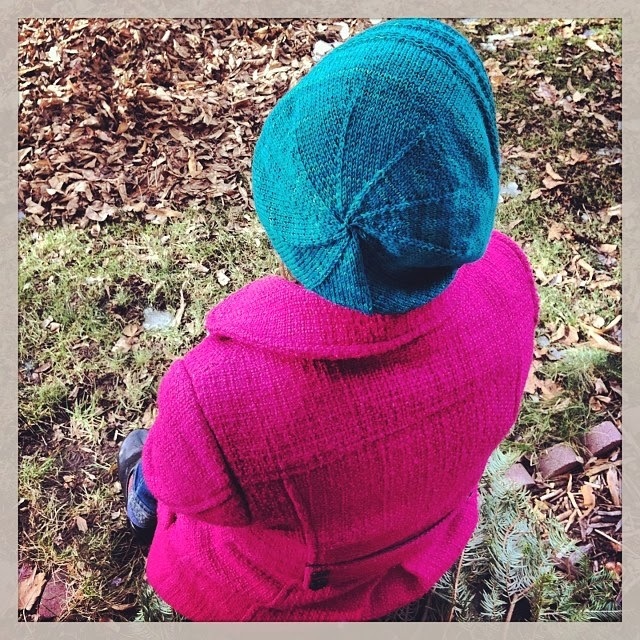 I have been working up the Green Gables Knits patterns in a variety of yarns and colors and you can expect to see some more "Green Gables Knits Instagram Galleries" here in coming months. 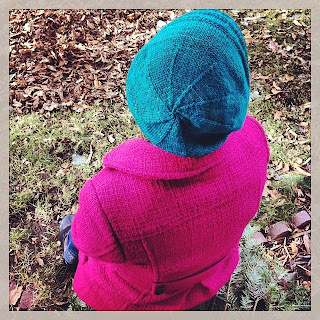 I am also thinking that a lot of these patterns will lend themselves very well to handspun yarn as well, I think I will begin with a handspun Diana's Hat to see how it goes!